Eating these fragile shells without a mishap is quite an art. Chaat Bazaar is one of the best places to try out your skills. There are few adult experiences that perpetuate how we eat, or more precisely, how we are fed as Indian babies. Each bite pushed towards us one at time, always larger than life, inflating our mouths to that breaking point where the laws of physics dictate that you can either hold the bite in, or you can chew, but never both. Or at least not without a leaky dribble down your chin. Pani Puri is one of those few experiences that continues to broker an intimate bond between the person feeding and the one fed—except that we’re all grown up now, and yet we’re standing out in public with leaky overstuffed mouths. If you are not familiar with pani puri, here is the Cliff Notes version: “Chaat” is Indian street food and is mostly vegetarian; it is often served from a “thela” (t-eh-la) or wheelbarrow, though the closest we get to thelas in the UAE are roadside chaat windows. Pani puri is one of the most popular and messy forms of chaat, and involves stuffing a hollow shell of deep-fried dough with sweet brown chutney, green chilli-tamarind water and often potatoes or moong (mung beans). Other aliases for pani puri include gol gappa (round mouth), puchka (onomatopoeia for the puri bursting in your mouth) and gupchup (shut mouth). Almost every north Indian has a utopian view of his/her own chaatwalla, though no one can pinpoint where chaat originated (except the people of Uttar Pradesh who have secret knowledge that it was really them). And finally, Indians are so passionate about chaat that many would extensively annotate this Cliff Notes version, while most would discard and rewrite it altogether. I stood outside Chaat Bazaar in Karama last weekend, one of many stops on a friend’s meticulously curated pani puri tour. 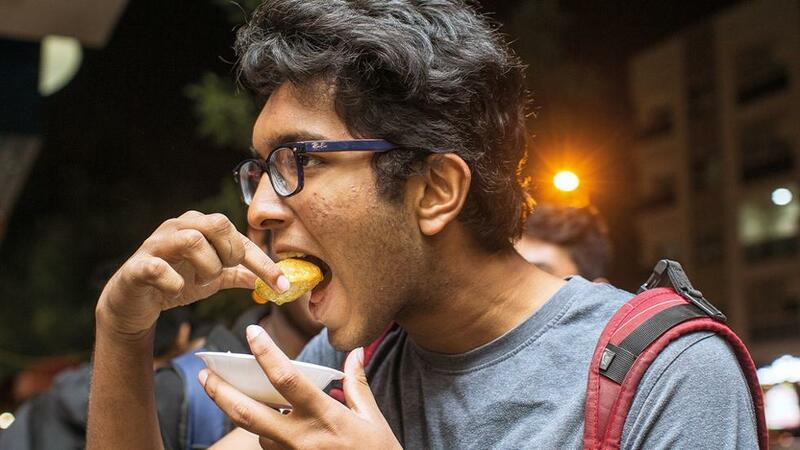 Varshik and I obediently joined the queue, eagerly anticipating our rapid-fire round of six crispy, spherical wafers, each wobbly with the sweet-spicy liquid that threatens to spill if you faff around with your phone. 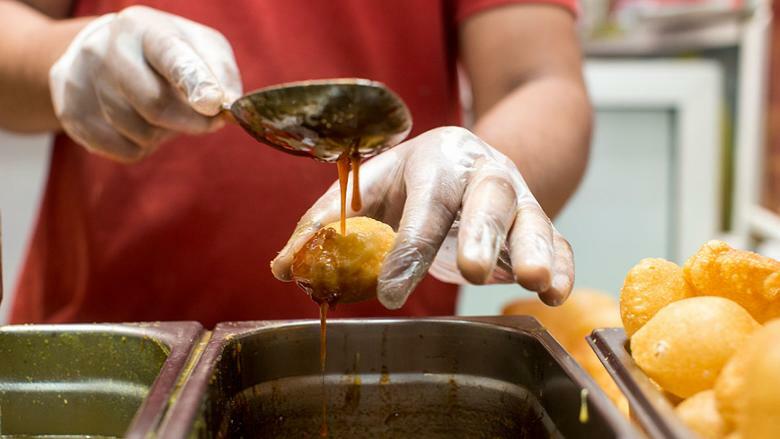 Dubai’s Karama, Meena Bazaar and Ghusais neighbourhoods are the weekend hubs serving up pani puri to masses of chaat lovers. But beyond the walk-in customers, one pani puri walla revealed that five-star hotels outsource chaat ingredients from his restaurant, too. This should come as no surprise; an Indian wedding might take place on the most extravagant patch of glittering hotel real estate, but the buffet counter would be incomplete without a chaat item or two. The best wedding planners will plant a live pani puri station along the buffet counter, and while no one dressed to the nines would typically be caught in public with a mouth crammed like the peak-time metro, distended cheeks and the occasional dribble are completely legitimate at the pani puri station. 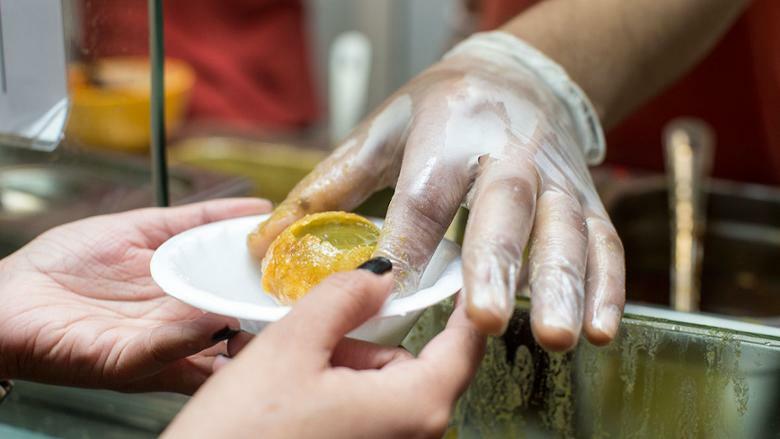 At the risk of sparking a heated controversy within the local Indian community, I will offer my personal favourites from Varshik’s pani puri tour. Rangoli’s pani puri hits top marks with a shatteringly crisp semolina puri that unlocks the floodgates to a distinctive yet cohesive sequence of flavors: sweet dates, sour tamarind, tangy raw mango powder and then a fiery cleansing trail of sulphurous black salt and green chillies. Along with Urban Tadka and Chaat Bazaar in Karama, they also give you the option of replacing the moong with warm curried chickpeas (“ragda”) for a more Mumbai-style pani puri. Chaat Bazaar gets bonus points for fully embracing the different pani puri varietals from across India, including moong and boondi, chopped potatoes, ragda and some inconceivable innovations. The thought of puris stuffed with pomegranate seeds, raw mangoes or paneer admittedly piqued my curiosity, but self-preservation quickly kicked in and I assure you, fellow Indians, that I did not venture into this rather blasphemous territory. Bombay Chowpatty stocks whole wheat flour (rather than semolina) puris that showcase the crunchy, brittle quality of a pile of Lays potato chips. The spicy water at Mithaas has a unique touch that I desperately tried to dissect, but the pani puri walla smiled back at my questioning gaze with pursed lips. Elco’s mediocre pani puris are redeemed with an excellent finishing “dry puri,” that final liquid-free puri topped with crumbly yellow sev and lip-smacking chaat masala. There were others whose names I have tried to erase from my mind. These were places that did not give you the option of standing at a counter but rather, relegated you to a table for a rather bland, DIY experience. These were places with oily or stale puris. Worse, these were places that, in addition to committing the aforementioned sins, popped open a sterile plastic packet of 6 puris and served them with a bowl of cold diced potatoes. No amount of yoga and deep breathing can help you heal after a round of frigid potatoes in chewy puris. As the third puri emerged onto my steel saucer at Chaat Bazaar, I couldn’t help but wonder what it must be like to work behind that window. 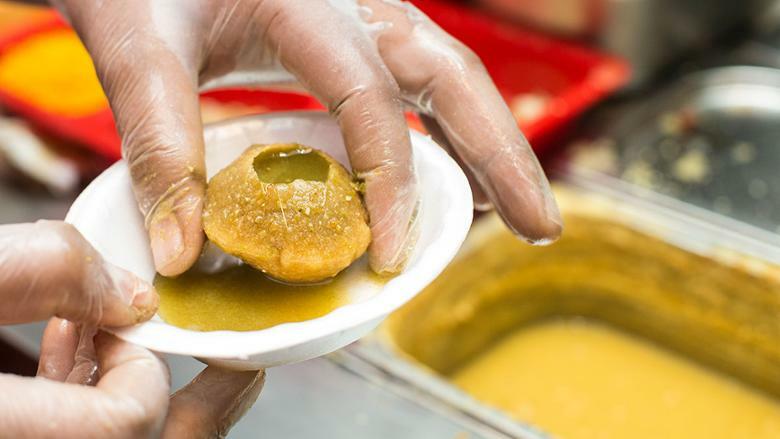 You, the “pani puri walla,” observe the contorted expressions of men and women, their cheeks unflatteringly full with a fat globe of fried dough that cannot be delicately crunched in two bites, unless the eater takes as much pleasure in wearing his chutney as he does in eating it. 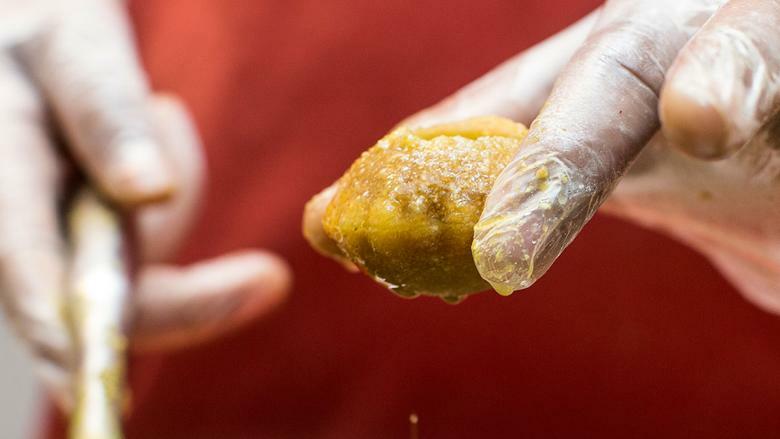 You, the pani puri walla, are privy to the ratio of fiery green water to sweet brown chutney for every customer approaching your window, nodding without judgement whether they ask for “theeka,” (spicy) or “50/50.” You will understandably judge the rare breed of Indians who ask for “meetha” (sweet). You, the pani puri walla also hold the irrational conviction that you can open up right next to another chaat counter and people will come, because obviously your pani puri is better. My recent heart-to-heart conversation with Sham, a pani puri walla in Meena Bazaar, centered on his desire to move back to India soon. I nearly dropped my puri when he confided his plan to open his own chaat business in the city of Indore—does India really need another pani puri walla? But Sham has a secret strategy that none of the other thelawallas seem to have, that the key to success is to market your brand into something famous, something hyped, something that customers would travel from afar to taste. Evidently, some of Dubai’s magic dust has rubbed off on him too. Pictures were taken at Chaat Bazaar.